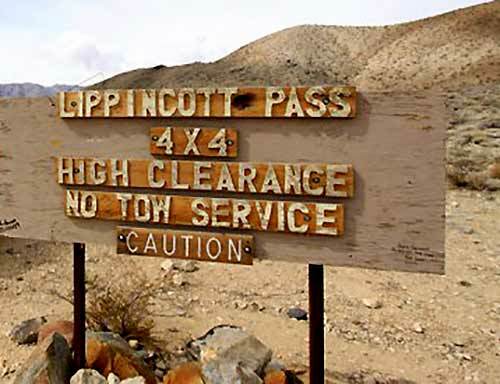 Lippincott Mine Road is a 7-mile, low-range climb from the Saline Valley to the Racetrack Playa in Death Valley National Park. Calling it a low-range climb is an understatement. It's more accurate to say that Lippincott Mine Road is a serious, high-pucker-factor, mountain-goat trail. Lippincott Mine Road (on some maps it is identified as the Ubehebe Road) takes off from Saline Valley Road, which is accessed off of State Highway 190 west of Panamint Springs. It is one of two ways to get to the Racetrack from the south. 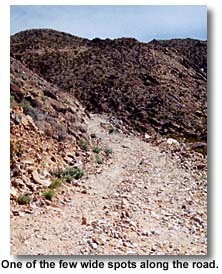 The other trail -- the Hunter Mountain and Hidden Valley route -- also takes off from the Saline Valley Road. Google Map link. With either of these roads you'll need a good map, as the routes are not marked and there are no signs. Also be aware that this area is seriously back-country. 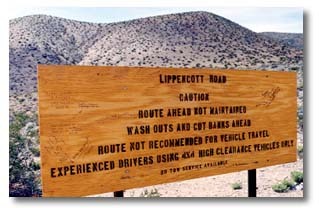 When we drove this trail, we did not see another vehicle or person for over 40 miles, just wonderful and empty desert. Be prepared for any kind of emergency, and bring extra water. On Highway 190, about 3 miles west of the road to Darwin, Saline Valley Road takes off northward. At the same intersection, Talc Mine Road heads westward. Follow Saline Valley Road north. After driving through a low pass in the Talc City Hills you'll come to the intersection with Santa Rosa Road -- stay right. Ten miles later (from leaving Highway 190) the road meets the Saline Valley Alternate (which also connects with 190) -- bear left. The next intersection is with White Mountain Talc Road -- stay to the right. 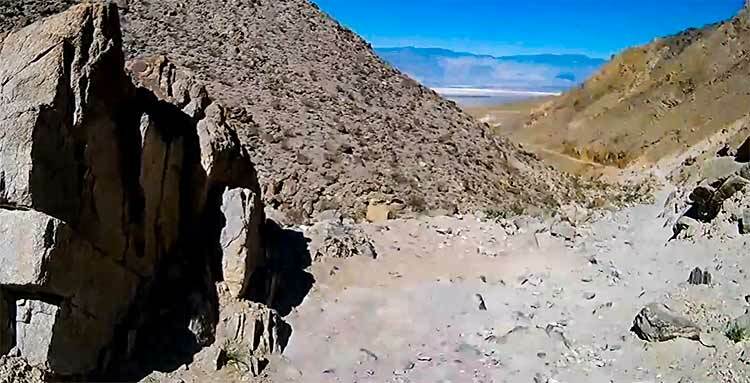 Now you're climbing into the Nelson Range, where there are range cattle, pinyons, juniper and even some digger pine and bristlecones -- and, interestingly, you're within Death Valley National Park. 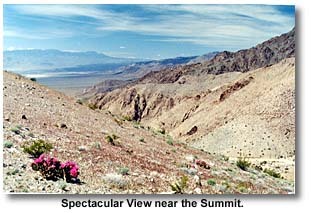 To the southwest you'll see the Panamints and Telescope Peak. Twenty-three miles after leaving Highway 190, you'll intersect with Hunter Mountain Road. This is decision time. Either way will take you to the Racetrack. Bear left if you're looking for a wild and hairy drive up Lippincott Mine Road. Eleven miles down Saline Valley Road (34 miles from highway 190) you'll hit the intersection of Saline Valley Road with Lippincott Mine Road (on some maps, Lippincott is identified as Ubehebe Crater Road). There's a large rock cairn. Turn right, and just beyond is a sign that warms the heart of any dedicated 4-wheeler, "Caution...Route Ahead Not Recommended for Vehicle Travel." Even better: they're not kidding. It is a warning to take seriously. You're only 10 miles from the Racetrack, but 7 of those miles are going to be on a low-range mountain trail. The trail rounds the foot of a mountain, then heads up a canyon that winds its way through spectacular scenery. The rocks are an interesting collage of volcanic lava, granite, sedimentary conglomerates and a lot of interesting quartz -- gold-bearing, perhaps, judging from the amount of mining and the number of prospect holes in the canyon. The climb gets very serious; this is slow, low-range work. There are washouts, most of which have been repaired with rocks, and in places you'll only have a foot or so between your outside tire and a disaster. The drop gets hairy, too -- hundreds of feet, not straight down, but not enough of a slope to matter -- a mistake would be fatal. There's an additional problem: if there's a breeze in the canyon, it will be coming from behind you, which, coupled with the low-range hard climb, can cause overheating. Watch your temperature gauge. The road tops out at a saddle. This isn't the summit, but it's a good stopping point, and the view is fantastic. There's room to park with your grill in the wind to let things cool. Further on, the pucker-factor eases as the cliff dropoffs are not as severe, but the trail remains a challenge with switchbacks and washouts and low-range climbs. The trail ends just beyond the summit at a nice bladed road, with another warning sign like the first for the traffic coming from the other direction. Beyond is the Racetrack Playa and many miles of gravel to Ubehebe Crater. But at least you're out of 4-wheel low, and there are no cliffs.